Zoe Pilger has been deliciously described as “a foul-mouthed Nancy Mitford for the Gawker generation.” What’s not to love? 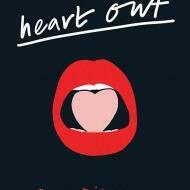 Her first novel Eat My Heart Out is both hilarious and horrifying in turns as her heroine Ann-Marie tears through London and beyond on a helter skelter ride. Zoe is The Independent’s art critic. Zoe and Donna discuss the hazards of modern womanhood and life as well as the wonderful relationship she had with editor Hannah Westland.